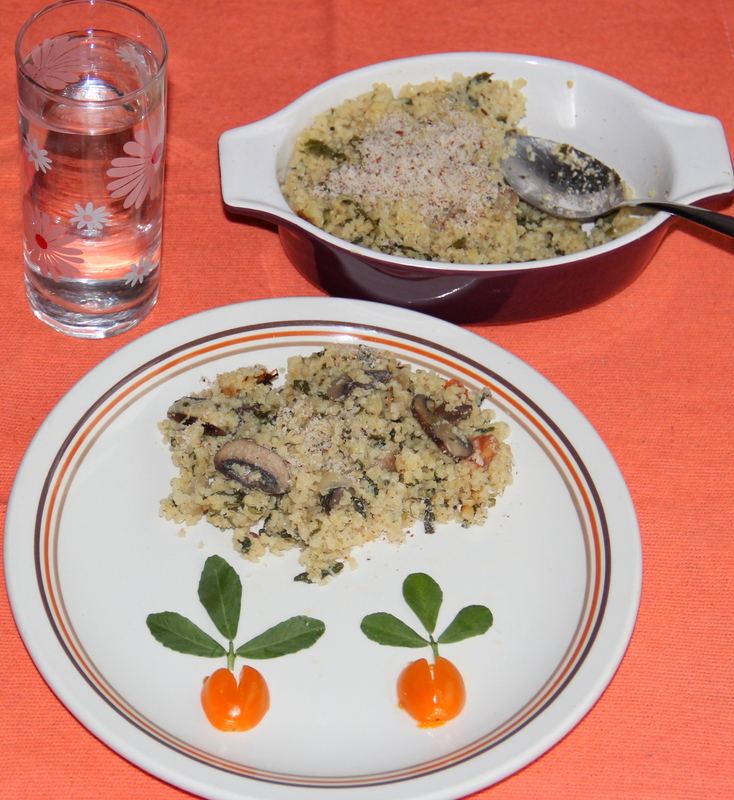 Fenugreek leaves and mushroom bulgur/cracked wheat is a simple yet stunning rice recipe. The fenugreek leaves highlights the earthiness of mushrooms. In this recipe I haven’t used any whole garam masalas so garlic flavour and nutty taste of flaxseed is enhanced. Spices can be personalised as per the taste. Bulgur wheat makes a healthy and quick addition to any meal as its whole wheat and is specially prepared to lessen the cooking time. It is good source of fiber, protein. Flaxseed (Linseeds) are rich source of micronutrients, dietary fiber. It is rich in omega-3. As per research flaxseed may help to lower the cholesterol level. Most nutrition experts recommend ground over whole flaxseed as the ground form is easier for your body to digest. This can be enjoyed for breakfast and good to go for packed lunch as well. Wash and soak bulgur for 30minutes. Drain after 30minutes and keep aside. Crush roasted flaxseed in the motor using pestle to coarse powder and set aside. Combine all the ingredients mentioned under grinding table in a blender/mixer and blend to coarse and set aside. Heat oil in the pan add mustard seeds, as it splutters add onion saute for a minute. Add tomatoes, mushrooms saute for 4-5minutes. Add fenugreek leaves, salt and fry until mushrooms are tender or almost cooked. Then add 2 1/2cups of water and bring it to boil. As the water comes to boil add soaked and drained bulgur/cracked wheat close and cook on a medium high flame for 10-15minutes. Finally as all the water evaporated and rice is cooked add ground flaxseed and simmer for 2-3minutes. Serve hot with yogurt/ any side dish. Posted on July 11, 2014, in Indian, Main dish and tagged Bulgur wheat recipes, Chitras healthy kitchen, drchdietfood. Bookmark the permalink. 20 Comments. ❤ ❤ ❤ Awwh so sweet of u Chitra! Thank you…It came out well..
yes. It is the lifestyle that forces to stay away. Also we hardly get such a healthy organic food..